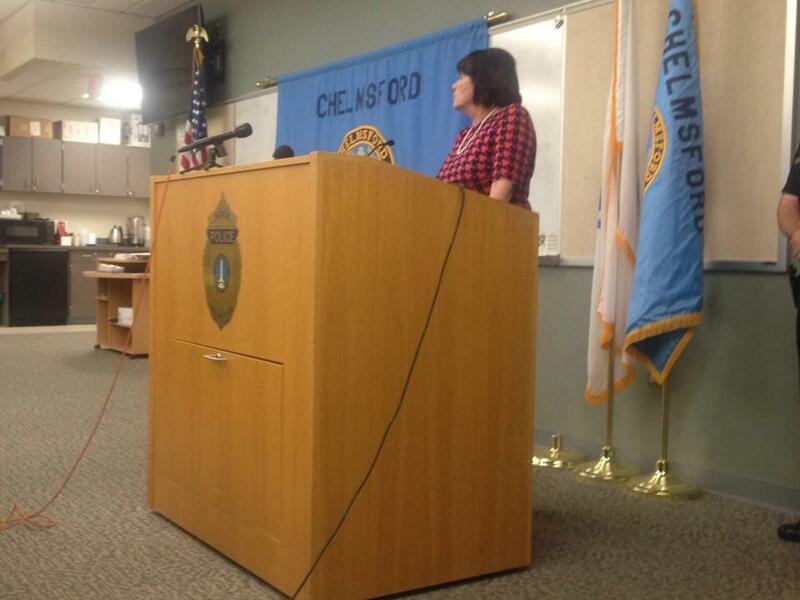 Middlesex District Attorney Marian T. Ryan addressed the media early Sunday in Chelmsford. CHELMSFORD — A Tyngsborough police officer shot and critically injured a 27-year-old man accused of leading police on a car chase across town lines, before dragging a Chelmsford police officer with his car door through the parking lot of a popular ice cream stand, authorities said. The man, who is from Tyngsborough, is in “very grave condition” at a Boston hospital where he was taken by helicopter late Saturday night, Middlesex District Attorney Marian T. Ryan said at a news conference early Sunday morning. The Tyngsborough police officer who shot the man was not identified. He was placed on administrative leave, which is standard department policy, Ryan said. The incident began as an attempted traffic stop in Tyngsborough, a small town on the New Hampshire border, at about 8:36 p.m. Saturday. The suspect fled from the Tyngsborough officer, who followed the vehicle down Route 3 to the Chelmsford town line, Ryan said. “The officer followed him for some period time,” Ryan said. The vehicle left Route 3, and as it entered Chelmsford on Route 40, a Chelmsford Police officer who was working a detail attempted to stop the vehicle, Ryan said. The suspect pulled into the parking lot of Sully’s Ice Cream Stand on Graniteville Road. As the Chelmsford officer walked up to the vehicle, the suspect began to back out of the parking lot, Ryan said. The officer got caught on the door of the car and was dragged between the suspect’s vehicle and a nearby police cruiser. He was treated at a local hospital for injuries to his arm, back, and torso, and he has since been released. “Fearing for the safety of the Chelmsford officer,” Ryan said, the Tyngsborough officer shot the suspect twice, she said. State Police assigned to her office are investigating, Ryan said. The incident shocked residents of the normally quiet neighborhood on a warm summer evening. A person who answered the phone at Sully’s declined to comment on Saturday. One nearby resident who identified himself only as Anthony said he was surprised to see police cruisers flying by his home around 8 p.m.
“The only thing that I know is that we were home, and multiple cop cars had gone by,” said the man, who lives three doors away from the shop. He said he noticed a car that had front-end damage in front of the stand. “There were probably about 20-30 people at the ice cream stand” at the time, he said. “A female cop was yelling at somebody to leave somebody alone,” he said, before police told spectators to leave. A MedFlight helicopter had landed next to his house, and at 10:45 p.m., there were at least seven police cruisers lined up from his house to the ice cream stand, he said. Globe correspondent Adam Sennott contributed to this report. Felicia Gans can be reached at Felicia.Gans@globe.com. Follow her on Twitter @FeliciaGans. Alexandra Koktsidis can be reached at alexandra.koktsidis@globe.com. Follow her on Twitter @akoktsidis.